Literature teems with doppelganger/secret sharer stories in which one personality of two strives to dominate the other. In “Jonathan,” the hook isn’t a transformative agent, like in “Dr. Jekyll and Mr. Hyde,” or a deep sense of denial as in “William Wilson.” The movie, directed by Bill Oliver from a script by Oliver, Gregory Davis, and Peter Nickowitz, opens with its title character speaking into a camcorder and describing the details of his day. 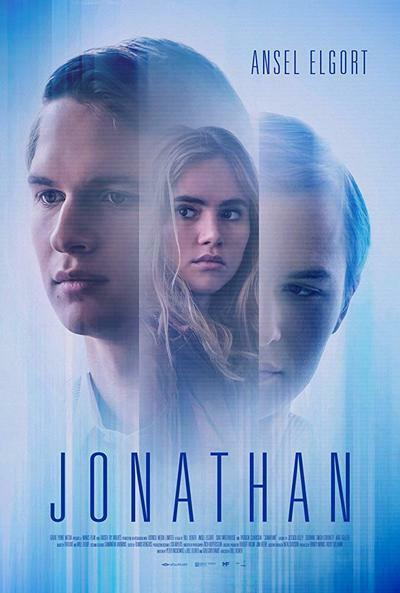 Played by Ansel Elgort, Jonathan is very proper. His posture is straight, he looks like he irons his hair rather than combs it. His videos get responses: from a guy who could be his twin, this one named Jon. This fellow leads a wilder life than Jonathan, you can just tell from his floppy hair, unbuttoned shirts, couch-sprawling manner. Jonathan works at an architectural firm and is considered something of a prodigy, this in spite of the fact that he can’t work a full day. His excuse is that he’s caring for a sick relative, but the reality is that he shares a body with Jon, who we presume is not nearly as talented. That’s right. Jon and Jonathan ae brothers via something called, in the film, single-body multi-consciousness. Their lives are kept separate via a timing splitter installed behind the ear by a doctor who’s supervising their existence, played by Patricia Clarkson. Jonathan is acutely aware that their coexistence is only possible if they adhere to strict rules, one of which stipulates no emotional involvements, that is, girlfriends. But Jon, who comes to life at seven in the evening (the young men have it worked out so they subsist on only four hours of sleep a night), has been seeing a barmaid named Elena (Suki Waterhouse, appealing and unaffected). Jonathan insists that this liaison cannot stand, and eventually confronts the young woman, who’s confounded by the suddenly weird, uptight personality her never-before-seen-in-daylight boyfriend has. Things go on to get more complicated. The one-body/two consciousness idea as articulated here is not entirely far-fetched, but the movie ultimately isn’t too interested in working out its plausibility angle. Rather, what Oliver goes for is a character study that’s ultimately about the nature of consciousness and of mortality. The director’s visuals are generally very cool, almost mentholated—some shots look to have been made through an ice-green filter—which contributes an eerie detachment to the movie’s mood. As the uptight Jonathan is pushed to loosen up a bit, the impulsive Jon seems to grow jealous, and moody, and the brothers are pushed to seek relief. But the movie is not interested in wrapping things up via a “smash the mirror” epiphany. It’s to Oliver’s credit that he’s taken a more tough-minded than easily cathartic approach. And Ansel Elgort’s wonderful performance does appropriate honor to the ambiguity the movie is trucking in.